Even though this is just in beta (tested versions were alpha release 0.03 and beta 0.04), I have spent far too much time with this application to just throw my experiences out the window. Sounds derogatory? It is, but not against the application. PM VNC is an OS/2 viewer (client) for remote desktop access to a VNC Server equipped pc via tcp/ip. There are XFree86/2 and Java versions of VNC Viewer for OS/2 PM, but PM VNC Viewer requires no more than emx runtimes 0.9c and above installed on your system. You can find PM VNC Viewer at the author's, Akira Hatakeyama's web site. Problems reports should be emailed to akira@sra.co.jp The archive also contains the entire source code. "Viewer" is misleading however, as you can manipulate the remote desktop. "Viewer" makes me think that you can only admire the other person's handiwork... what possible use is that? You want me to see it, then send me a bitmap. You're allowing me to use it, then I'll need PM VNC Viewer. Special key combinations such as CTRL-ESC or ALT-F4 are all hooked by PM, and never send to server side. Especially, all ALT key combinations are never send to server. It causes a lot of problem when using WIN95/NT via WinVNC. You can't send CTRL-ESC or C-A-D to Windows machines. No support for clipboard (from server, to server). But these have all been cured in the current beta release. You can alternately type "vncview " from the command line, along with other switches discussed below. -true Request '32 bits True Color' to server. 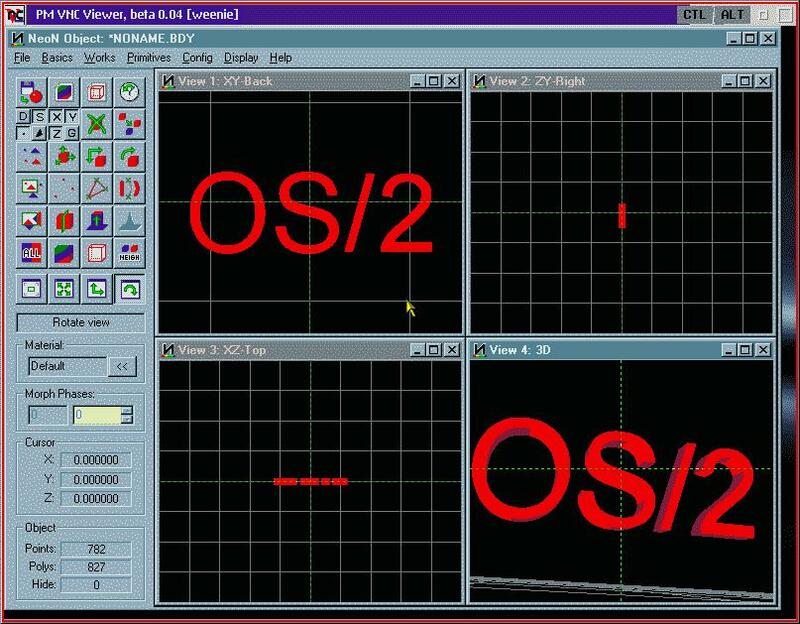 Viewer hold display image with 24 bits true color. -bgr233 Request 'bgr233' 8 bits pixel format to server. Viewer hold display image with 8 bits bitmap. -tiny Request 'bgr233' 8 bits pixel format to server. Viewer convert it to default 16 colors. -gray Request 'bgr233' 8 bits pixel format to server. Viewer convert it to 4 level gray scales. For my testing of the alpha, I used the 8-bit option for speed. When you're hooked up to the net via a dialup connection over two tin cans and a piece of string, speed becomes an issue. "Why use the net?" you ask. "Why not try it on a LAN?" The derogatory remark made in my first paragraph was directed solely at me... the world's stupidest networker (or is it networkee?). Probably neither, but then you can't say I didn't warn you. Networkly challenged is what I am, no matter how you phrase it. There is either some little secret that the rest of the world knows but is not divulging to me, or I'm missing those brain cells normally devoted to networkism. I suspect the latter, and you can blame THAT on the 60's. Although it was painfully slow over the internet, it did work remarkably well. I was able to manipulate my friend's desktop within the constraints of what he allowed me to do. Window controls could all be accessed from my end, I was able to type commands into his shell window and see results. I imagine I would have been able to launch applications as well, but not knowing a) what apps were available to me, and 2) what commands were needed to launch the apps, I left that area untested. Here you see the win32 version of Neon Object running on the win machine fondly referred to as "weenie". All actions, including starting the program, were performed from my OS/2 desktop. The display fits quite nicely... The OS/2 machine uses 1280x1024, while Weenie uses 800x600. One point I did find a little annoying in the beta... the only way to exit the viewer is via the alt-f4 or menu option... if you look at the two connection screens above, you'll see the CTRL and ALT tabs cover the default Warp 4 close box in the current release. These tabs provide CTRL and ALT keypresses to the server machine. Selecting a tab changes its background to white, indicating that the server machine's corresponding key is depressed. 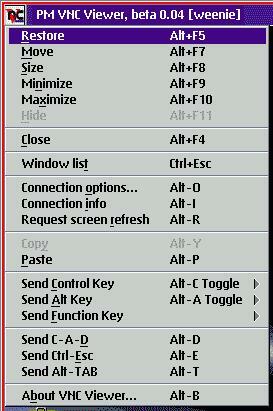 Any keyboard entry while the tab is selected issues that CTRL-x or ALT-x instruction to the remote machine. Probably quite necessary, though I wish they could be moved to the left somewhat. Overall though, accessing win32 applications via VNC exceeded my expectations. Anyone on a LAN with OS/2 and Win machines should give this a try... you'll be pleasantly surprised. PM VNC Viewer for OS/2. Finally an application that brings all win32 applications to your OS/2 desktop.